daDup is developed in 2016 by Tuxis Internet Engineering. We kept getting questions like "Can we rent cheap storage so we can make a copy of our NAS" and "I need a storage solution in a datacenter to duplicate my data to". Always followed by the words secure and privacy, and S3 was a protocol that was suitable for them. And since we know how to build storage solutions and clusters we decided to build the solution on our equipment in our racks in the heart of the Netherlands (Ede). That is how it started. 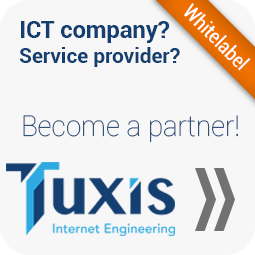 Tuxis delivers to IT service providers and enterprises with one or more system administrators. Since 2009 we use the datacenters from BIT in the Netherlands to deliver our cloud services. Our clients buy high-quality Internet services such as colocation, customized web hosting, e-mail, telephony, online backup and (private) cloud environments. In particular, customers who require high capacity or have any special requirements fit well with Tuxis while also providing the convenience of turnkey SAAS services.